ST. PETERSBURG, Fla. -- Minor League Baseball Charities today announced the distribution of over $180,000 in cash to charities assisting with recovery efforts in the aftermath of Hurricane Harvey and Hurricane Irma. Minor League Baseball's 160 teams combined to raise over $300,000 for disaster relief. The city of Corpus Christi, Texas, and the surrounding communities suffered significant damage during Hurricane Harvey. 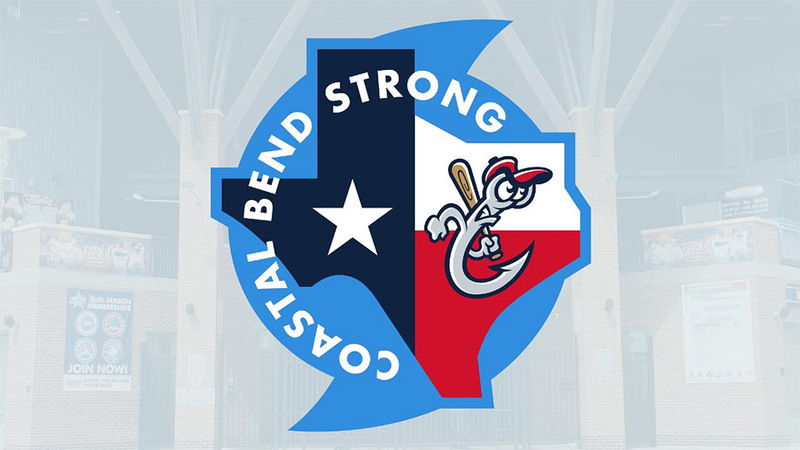 As a result of Minor League Baseball's fundraising efforts, the Corpus Christi Hooks, the Double-A affiliate of the Houston Astros, made a significant donation to the Coastal Bend Disaster Recovery Group and will be making donations to Little League programs in Port Aransas, Rockport, Refugio, Aransas Pass and Ingleside to help the leagues repair facilities and purchase equipment that was damaged or lost in the storm. "We are overwhelmed with gratitude at the generosity of teams across Minor League Baseball as our industry meets the needs of those who have come into harm's way," said Corpus Christi Hooks Vice President of Sales and Marketing Andy Steavens. "These funds will help fuel recovery in the Coastal Bend as the calendar turns to 2018. It's a long process, but we're pleased and privileged to help and proud to be a part of this region and Minor League Baseball." "These donations are another example of the collective power of Minor League Baseball and our 160 teams across the country," said Courtney Nehls, Assistant Director, Community Engagement, for Minor League Baseball. "In times of need, whether a natural disaster or otherwise, our organization and its teams have proven time and time again that together, our charitable efforts help build stronger communities." With the devastating flooding that took place in Houston, Minor League Baseball Charities made a significant donation to the Houston Astros Foundation to assist with its disaster relief projects, and with guidance from the Astros Foundation, made donations to the Houston Police Department's Blue Santa Program, the Houston Food Bank and the Houston Children's Charity, which will provide beds and linens to children when they return to their homes. As Hurricane Irma cut a path across Florida, three Florida State League communities and one Southern League community saw extensive damage, and Minor League Baseball raised over $50,000 for relief assistance in those areas. The Fort Myers Miracle, the Class-A Advanced affiliate of the Minnesota Twins, split a donation from MiLB Charities between eight worthy organizations in their community: The Harry Chapin Food Bank, Everglades Wonder Gardens, Goodwill, Lee County Schools, Midwest Food Bank, Naples Zoo, New Horizons of Southwest Florida and the Southwest Florida Community Foundation. The Charlotte Stone Crabs, the Class-A Advanced affiliate of the Tampa Bay Rays, donated their portion of the Hurricane Irma relief funds to the United Way of Charlotte County to assist with their continued recovery efforts. The St. Lucie Mets, the Class-A Advanced affiliate of the New York Mets, split their donation between the Mustard Seed Ministries, SAFER St. Lucie and the United Way of St. Lucie County. The Jacksonville Jumbo Shrimp, the Double-A affiliate of the Miami Marlins, donated their portion of the Hurricane Irma relief funds to the Trinity Rescue Mission Women and Children's Center. In addition to the $180,000 distributed by Minor League Baseball Charities, Minor League Baseball teams made donations totaling over $120,000 directly to relief organizations including the Red Cross, The Salvation Army and United Way Worldwide.